Gemma Doyle is getting ready to go home to spend Christmas with her family. The holidays promise to be a busy time filled with many social engagements, but balls and dinner parties aren’t all that await Gemma. The Rakshana want her to bind the magic that she set free in the realms, but not without giving them the control of it they believe they are entitled to. Gemma knows that her enemy, the power-hungry Circe, is also still looking for her. With the fate of the realms’ magic resting in her hands, Gemma is a target and cannot afford to trust the wrong person. She has to put her faith in someone, though, because it is the only way she’ll find the Temple, the source of the magic and where Gemma must journey in order to contain it once again. 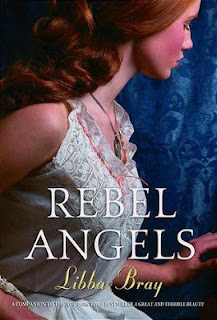 After being wowed by A Great and Terrible Beauty, I couldn’t wait to dive into Rebel Angels. Libba Bray’s writing in the first Gemma Doyle book was fantastic, and I devoured the follow-up as fast as I could. I was all too happy to return to Gemma’s world, or should I say worlds, because once more, we’re transported back to Victorian England as well as to the magical realms, where anything you can imagine is possible. In A Great and Terrible Beauty, Gemma destroyed the runes that bound the realms’ magic. Now that it’s free, it can be used by anyone for any purpose. Gemma’s nemesis, Circe, is still on the loose, desperate for a way into the realms so she can seize their magic for her own evil plans. The secret brotherhood of the Rakshana is all for binding the magic—in its own name. Meanwhile, Gemma is preparing to go home for Christmas. Even after all she, Felicity, and Ann have been through together, including the loss of Pippa, it’s business as usual between the young ladies. This means petty jealousy, occasional cattiness, and plenty of scheming. There’s a lot going on in this book just on the non-supernatural front. Felicity concocts a sob story for Ann; she’s now descended from Russian royalty and the long-lost relative of a duke. Ann continues to be besotted with Gemma’s older brother, Tom, who takes much more notice of Ann once he hears about her “lineage.” We also find out the horrifying secret Felicity’s been hiding about her family life. Yes, all that happens in this little group can approach soap opera-level dramatics at times, but that’s a big part of the appeal of this series for me. I enjoy reading the minute details of these girls’ lives, even when they’re acting less than sensible. You don’t know how many times I wanted to tell Ann to shut up because she was burying herself alive with her big mouth. I was embarrassed on her behalf! I do wish that the girls had shown a bit of character growth from the previous novel. Ann is still timid, Gemma still wavers between being snippy and letting her conscience get the better of her, and Felicity is still, well, Felicity. I was a little torn between this feeling of comfort that went with being back among familiar characters and this tiny, nagging sensation that they seemed all too familiar, like they hadn’t learned much from their prior experiences. This is particularly true for what went down in the realms in the last book. The romance gets turned up in Rebel Angels, with Kartik from A Great and Terrible Beauty continuing to be a presence in Gemma’s life and the introduction of Simon Middleton, the son of a viscount. Gemma can’t help but be attracted to Simon; he’s handsome, wealthy, and has all the right social connections. Yet Gemma can’t quit thinking about Kartik, especially since he seems to be showing an interest in her, as well. I was surprised to see the novel head into love triangle territory after the romance was rather low-key in the first book. Fortunately, it doesn’t overtake the story, and no one mopes over heart-related matters. Where Bray knocks this out of the ballpark is with the descriptions of the realms. The imagery! Although Gemma and company spent time there in the preceding book, the realms are explored at much greater length here. The unbound magic is changing them, blighting their beauty. The girls also meet some of the inhabitants: centaurs, water nymphs, and a gorgon who’s a living part of a boat. Most aren’t friendly, and the Poppy Warriors, these sort of demonic knights who feed on fear, scared the hell out of me. Why do I always wind up reading the most frightening parts of books late at night? Every time Azreal, their apparent leader, creepily addressed one of the girls as “poppet,” it was as chilling as Naughty John’s whistling in Bray’s The Diviners. I’ve gushed before about how brilliantly Bray makes the paranormal feel so real, and what she does here with the realms is exceptional. Rebel Angels is longer than A Great and Terrible Beauty, but I didn’t find the additional pages to be an issue. I actually stayed up late one night to finish the 200 or so pages I had left because I needed to know what happened. While the book doesn’t end on one of those scream-inducing cliffhangers, I still have several questions that I’m eager to see answered. Looking at the size of the final book in the trilogy, The Sweet Far Thing, I’m hoping that I’ll find everything explained satisfactorily. The realms truly made this book for me. I enjoyed reading about Gemma’s London life, too, but I was completely mesmerized by the magic here, even when it gave me a severe case of the creeps. I do agree that the girls didn't see much character growth from book to book. That's probably one of the biggest issues I had with the series, though if I remember correctly, it did get better towards the end of book 3. Maybe. But yes, the imagery and atmosphere of the Realms is what sold this book for me. It was so vivid and well-done. Looking at the page count for The Sweet Far Thing, I really hope there's some character advancement in there. It would be disappointing if there isn't, but I think I'll be OK as long as plenty of time is spent in realms again. I really didn't like Tom in the first book and he continues to be pretty shallow in this one, still looking out for a rich young lady to marry. He does show a more mature side here and there, so we'll see which version turns up in book 3. This sounds really cool, I want to check out the series! I think you'll enjoy it! It's like costume drama meets supernatural, lol.